Kokopelli tattoo designs are an intriguing way to bring the past into the present. Learn more about this popular figure and how you can turn one into a very unique tat of your own. 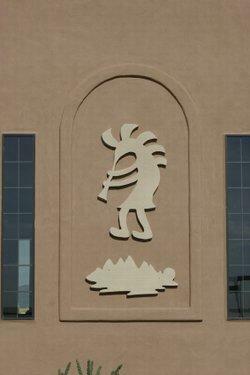 You may have seen a Kokopelli figure before even if the name sounds unfamiliar. A Kokopelli is a glyph-type drawing of a man playing a flute as his hair flies up wildly from the back of his head. He's either clothed in a simple native dress or presented as a stick figure. This description may make the Kokopelli sound like a pop art icon, but the image actually comes from very ancient petroglyphs found scratched onto boulders and rock walls throughout the North American southwest region. 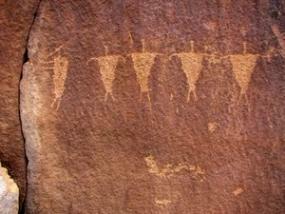 It's believed the glyph represents the Anasazi fertility god who reigned over the production of crops as well as human fertility. As legend has it, Kokopelli also ushered in the change of seasons with the songs he played on his flute. This god was also regarded as a symbol of hope, so it's not surprising that his image has been appropriated for tattoo designs. If this simple figure and his story of hope and change appeals to you, you might want to consider the following ideas for Kokopelli tattoo designs. Both the message and the rustic nature of the drawings are very compelling. A Kokopelli figure may look a little lonesome by itself, so you may choose to use a variety of other petroglyphs which will add more interest to your total tattoo design. A Kokopelli looks great playing under a sun glyph. Your tattoo artist can easily create this element using a simple circle for the main body of the sun surrounded by a series of smaller circles or lines to represent the sun's rays. You can leave your circles completely open, fill them in all the way or add dots to their centers. The real beauty of the design is that the circles don't have to be perfectly round. In fact, they actually look more authentic if they aren't. You can embellish your tattoo design even further by adding a river. All this requires is three wavy horizontal lines stacked one on top of the other. If you prefer an ocean, just add more lines to create the impression of greater depth. Birds are literally stick figures in this native design genre. Start with one vertical line for the body. Add a slightly angled horizontal line at the top for the head, but make it a little longer on the back end. You can add extra smaller lines fanning off the back of the head for feathers. Add a few lines sprouting from the bottom of the body for tail feathers. Finish by adding a horizontal crossbar to the body for the wings, and drape some vertical lines at each end for wing feathers. Now you have a bird glyph. Mountains are another simple addition you can add to your design. They are created from a single line that rises to a peak and then falls. This element looks especially good in a series of three mountains of varying heights. If you're only planning to have a single Kokopelli inked, you have a lot of placement choices to consider. The design would look great on an upper arm, side of the leg or over a shoulder blade. You might want to even consider it for a lower back tat.Multiple smaller figures could be used to create a wrist, arm or ankle bracelet, as well as a very creative sleeve. Designs with more than one element might look better as a back or chest tattoo, especially if you want to create a full scene to go with the figure. 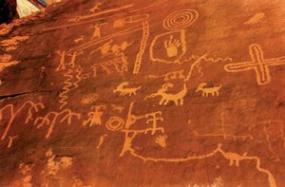 Click on the following links to see Kokopelli images.